Improve the looks and feel of your braking system with AS3 Performance Venhill brake lines. Constructed from marine grade stainless steel AS3 Venhill brake lines eliminate expansion in the hose to significantly improve feel and response throughout your breaking system. 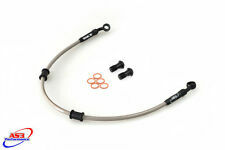 Suzuki GSXR SRAD 600/750 Front Braided Brake Hoses. facilities, any work undertaken at very competitive rates. 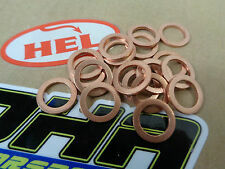 M10 Copper Crush Washers suitable for most brake line applications including HEL, Goodridge and most standard systems. Genuine HEL Performance item. TOP SPECIFICATION PRODUCT FROM GENUINE UK SUPPLIER. HEL Performance Stainless Steel Single Banjo Bolt. Genuine HEL Performance item. Manufactured from the finest grade stainless steel in the UK. TOP SPECIFICATION PRODUCT FROM GENUINE UK SUPPLIER. 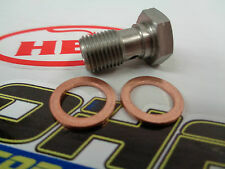 The kit is supplied with stainless steel banjo bolts and copper washers in order to complete the fitting of your new HEL Performance clutch line kit. 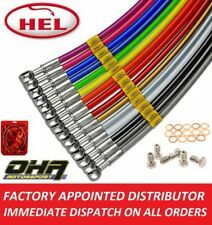 HEL Performance Stainless Steel Braided Brake Line Kit. 1 front 1 rear Cobra Braided Brake Hoses. Cobra Performance OEM brake line kit to fit Aprilia RS 125 1999 - 2005. Braided stainless steel brake line with wipe clean PVC coating in 12 colours. Brake hoses must be fitted by an experienced technician. > Venhill brake lines use smooth bore Dupont Teflon hose for better heat resistance. > Venhill brake lines - The ultimate fluid transfer system. Dont just replace, upgrade with VENHILL. > Stainless steel braided brake lines are used by professionals in MotoGP, World Super Bikes, British Super Bikes. Cobra Performance clutch line kit to fit Aprilia Futura RST 1000 2001-2004. 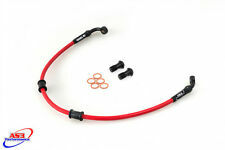 Cobra Braided Clutch Hose. Braided stainless steel brake line with wipe clean PVC coating in 12 colours. This kit contains 1 single clutch line running from the master cylinder to the slave cylinder. Akrapovic Clothing. Harley Davidson. Moto Guzzi. Cleaning Products. K&N Motorcycle Filters. Rapid Bike Fuelling Modules. Filters and Fuelling. Yoshimura Crash Protectors.